What do we do as a Guild of Costumers? As we mentioned, there are many different facets of our organization but they fall primarily into two categories: Fun and Educational. And we have regular meetings which tend to fall into both groups. Frozen custard at Mr. Wizard's after a meeting. 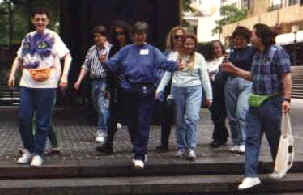 The fun stuff includes field trips, historical dance events, theme parties, and general horsing around. 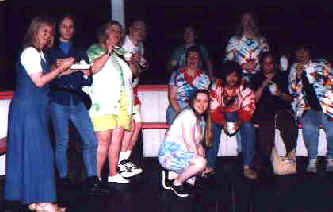 We go shopping together (en masse and sometimes out-of-town), and indulge in typical "gang-like" behavior; at least typical for our gang. 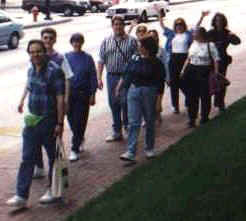 Baltimore 1997 -- heading for the Harbor. Before..... 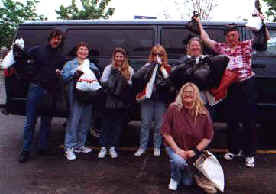 In 1999 we rented a 15 passenger van and drove to Chicago for a little shopping in the Indian district. 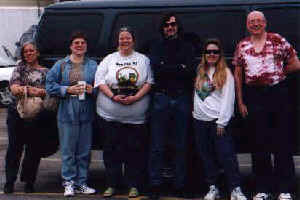 There were only seven of us (this trip, we're threatening to go again) but we needed the extra space for all of our purchases. 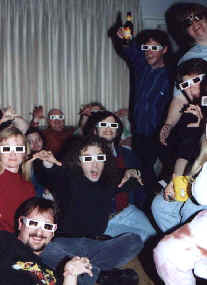 Special meeting silliness -- One of our "3D Dave" meetings where Dave Schenken shows us some of his 3D slides (we all get to wear funny glasses). What kind of costuming do we do? In brief -- all kinds! More specifically that includes: Science Fiction (original and recreation), Fantasy (ditto), Historical (recreation and interpretation), Original Fashion Design, and Wearable Art (which frequently encompasses all of the above). 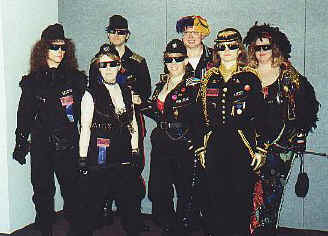 The Costume Cops -- a past group project based on altered and decorated Dickies coveralls.